The activities of car cloning syndicates has cost the government RM30 million in lost taxes, according to the Road Transport Department (JPJ). The department estimated that around 2,000 cloned cars had been brought into the country, mostly from Singapore, Bernama reports. “Most of the cloned cars were brought in from Singapore, which has an expiry policy for vehicles every five years and the syndicate is using that opportunity to produce cloned cars. Because of this, the country has lost about RM30 million this year as the syndicate has been able to avoid paying taxes and also falsified documents for the vehicles,” JPJ director-general Datuk Seri Ismail Ahmad said. He said the the department will be using the Vehicle Entry Permit (VEP) system, which will register all foreign cars entering the country’s gateways, next year to curb the growing issue. He also reminded the public that these cars do not have insurance coverage and as such represent a danger to both owner and other road users. He added that the department had been mounting operations to weed out cloned cars and had obtained significant results. “A total of 371 cloned vehicles of various makes were confiscated since the operations began in November last year, while two syndicate members were also detained,” he said. 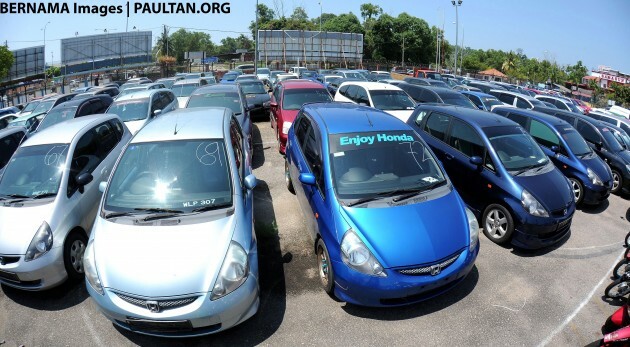 Another news report stated that of this number, Terengganu registered the highest number of cloned cars with 166, 88 of which were Honda Jazz models. Why? Easier to register such cars in Terengganu? The next time you go on holiday to the east coast, make sure you don’t get accident with a jazz. Who knows it’s a clone without insurance?? In Brazil, the clone feraris. Registered in Terengganu does not mean the clone cars are in the state. Nowadays you can register online a car in any JPJ branch in any state you like. The clone cars are all over the country. Another question is how did such cars pass an inspection for it to be register in the first place? still wondering why this happened in the first place? Nothing to wonder… Nasi lemak managed country alwiz like that…it is function as designed nasi lemak system. Ada pegawai yg makan tepi la tu…da rampas tu simpan je ke…? Meantime, JPJ lost another few millions for failure to “saman” those over tinted windows, flying boy modification car, smoggy buses and taxis. JPJ oh my JPJ… U ni macam GT1M la… That 30million kan sudah masuk poket u …. Takkan ni semua berlaku without ur knwoledge. Kena roadblock pun u tahu mane kete clone punye n kasi lepas… Hahahahaha…masih mau wayang2 ke? so how actually the “cloned”car being registered in the first place? do they hv reg cert? anybody on the authorities will be charged????? Annual 7 billions collected taxes compare to 30 millions loses… This’s nothing for JPJ. Rakyat were the only suffering from high taxes ! government is more concern on the lost of taxes rather than people’s safety. RM30m only wanna create big issue? JPJ sold plate numbers also can get RM400m every year. If includes summons and roadtax these numbers are staggering. Ask unker jibby to donate rm30m from his 2.6 billion..taik hidung je..
How weak the system until some people can take advantage. I believe everybody will not happy when other car has the same plate number. Maybe one day police come to your house and said you involved in criminal case. or you got summons. JPJ need to address this issue as security concern. Not about tax only. The buyers of these clone car are the culprit. Can you belief these man want to use Honda Odyssey, but only willing to pay RM20k for it? It is a joke. If you cannot afford it, just live with Kancil or Wira. Or work harder. And how many billions lost to the country by giving away free APs? Pray tell. Jpj, please look at your own backyard first. What is 30 million compare to lost incurred by 2MDB? The main reason…”Because of this, the country has lost about RM30 million” JPJ nk duit je sebenarnya..